Can a residential redeveloper invest in something that isn’t there? Perhaps even more importantly, should they? The answer will vary between investors, but the truth remains: The more you know about a real estate new build, the better your chances are of making money on the back end of a deal. If you have ever considered investing in a real estate new build, I maintain that the best way to place the odds in your favor is to mind due diligence. Educate yourself on the process and follow the simple steps I outline below to place yourself ahead of the competition. Not unlike every other exit strategy known to investors, the real estate new build comes complete with an array of options; each of which are less obvious than their post-construction counterparts. If for nothing else, a real estate new build is a blank canvas that may or may not have a predetermined fate. That said, the land a real estate new build is on could very easily determine the direction things head from the moment it’s acquired. Some builders may intend for the land to be developed into a neighborhood with track homes and an intricate infrastructure already in place. On the other hand, some land owners may have no plans at all. Either way, it’s on you as an investor to not only identify what the land will be developed into, but whether or not the direction suites your needs. Only once you know what can be done with the land should you consider moving forward. The last thing you want is to buy property for a real estate new build, only to find out you can’t do what you intended. In my experience, you are just as likely to find a raw land investment opportunity that has every intention of becoming a zoned neighborhood project (complete with utilities, infrastructure and street planning) as you are to find undeveloped land that hasn’t been spoken for. Never assume one way or the other. Instead of assuming the land you intend to purchase is or isn’t part of an elaborated development project with zoning laws, I recommend delving in head first to find out for yourself. It’s reasonable to assume that the land in question is already spoken for and that plans are in motion to be carried out on a respective builder’s behalf, but that isn’t always the case. Mind due diligence and and take special note of the plans that may or may not be in place the land you want to acquire. The plans for the land in question will heavily influence what you can do with the property once you acquire it, so make sure you are comfortable with the direction the previous owner put into motion. In uncovering the fate of the land, I maintain that you will want to discover the reasoning behind the seller’s motivation. It’s in your best interest to know why the real estate is up for sale in the first place. More often than not the seller will be transparent, but you need to make sure they aren’t concealing any potential problems. Land owners stand to make more money off of a property after construction, which begs the question: Why sell early? It’s not uncommon for builders to need access to more capital to complete their project. That said, some may sell earlier to fund the rest of their project. Other times, they may need outside investors to receive loan approval. Whatever the case may be, uncovering the seller’s intentions can tell you a lot about the land you want to buy. Outside of understanding the seller, I recommend taking the time to evaluate your competitions’ sentiment towards the land in question. If for nothing else, gauging the competitions’ interest in the raw land should serve as an indicator as to how profitable the project may be. Seasoned residential redevelopers and investors are more than likely experts in their region, and are more than capable of identifying a great deal. That said, increased completion may come at a higher price, but it’s a good indicator as to whether or not a real estate new build is worthwhile. Understanding your competition will also give you a better idea of the market you are working in, which is just as important — if not more so. 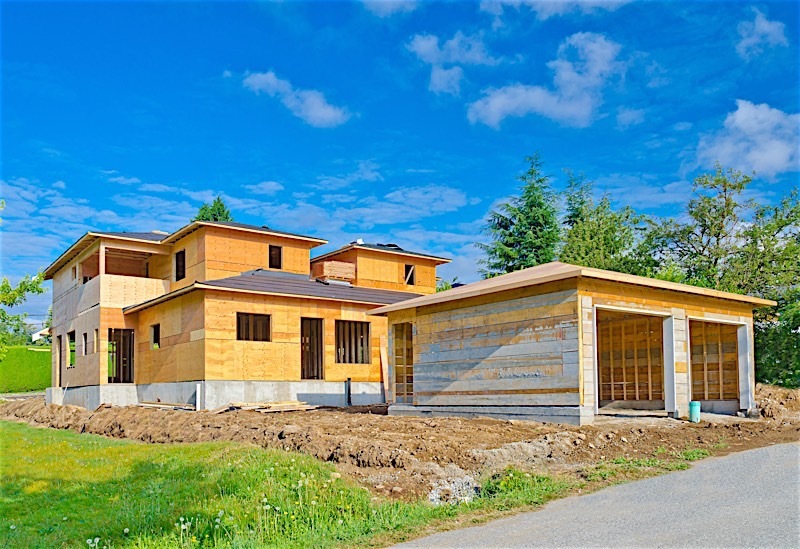 It’s worth noting, however, that any intentions of buying a real estate new build come with a caveat that existing homes don’t necessarily share: While the future of the housing market is always important to the prospects of a home, a real estate new build will require you to speculate on the home’s market value after completion, as opposed to the present. This is important to keep in mind when looking to buy a real estate new build; the market may be in a much different place by the time the home is built. When you start a real estate career, and it comes time to look for a property, I recommend working with a real estate agent that specializes in real estate new build transactions. It’s not uncommon for some realtors to specialize in pre-construction land deals, and their knowledge will be invaluable to even the most seasoned investors. I maintain that the costs you cut in skipping a real estate agent aren’t worth the savings and time they can provide, so take my advice and work with a real estate agent that specializes in this area. They will assist you in everything from setting up meetings with the builder to negotiating a better deal. Those looking for the best spreads should make it a priority to seek phase one pricing. Not surprisingly, the first phase of a development project is synonymous with the cheapest acquisition costs. Subsequently, the lower the cost, the larger the spreads. Of course, it’s harder to determine an accurate valuation of a property that hasn’t been built yet, but those that have done their homework on market conditions could find a great deal at the earlier stages of development. It is also at this time that you will want to make certain that the land you intend to develop can be used the way you want it to. Don’t hesitate to ask your agent about zoning restrictions and land use laws. For a better idea of what you are getting into, I recommend contacting the local municipality to see what they have to say about a respective area. It’s worth noting that a raw land investment, regardless of it’s predetermined fate, can be a very lucrative exit strategy. However, a real estate new build will coincide with a lot more due diligence than the average exit strategy put in place to compliment existing homes. In addition to your typical flip, raw land investing will require you to pay close attention to zoning laws, surveying, utility organization, and a slew of other things. You must account for all of this (and more) when weighing your options against each other. Not unlike your standard existing home, purchasing a real estate new build is a complicated process. However, that’s not to say it isn’t an endeavor worth pursuing. Any exit strategy involving a real estate new build can reward anyone that minds due diligence and does their homework ahead of time.